What good is data if no one understands it? Our modern world is awash in information. Every day, we’re overwhelmed with facts and statistics, pelting us with little bits of disconnected information. Data alone is not sufficient for understanding or insight. Without context, data is just numbers. Which is why, in an era of reduced trust in science, it’s vital to present scientific results in eye-catching ways that are simple to digest but also invite exploration. Enter the data visualization. Each year, The Kantar Information is Beautiful Awards highlight the best designs. A well-executed visualization must be accurate, useful, thought-provoking, presented via an elegant design that serves its subject matter. Here are 6 of our favorites from the 2018 shortlist. How does search data reflect real life? This visualization draws on Google Trends data to compare top searches for common health issues in the US with the actual location of occurrences of those same health conditions. 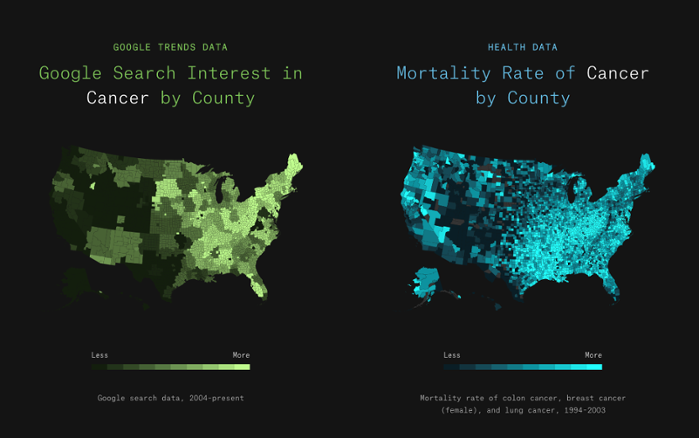 Compare rates of search interest for cancer, heart disease, stroke, diabetes, and depression by county. Does awareness correlate with risk? Here at Science Node we write a lot about AI and machine learning, but we’ve never asked the question explored by this visualization: How do machines experience the world? In an attempt to find out, this project visualizes the raw sensor data collected by our phones and other devices. Unlike many visualizations that aim to make data more relatable, Albrecht’s goal is to emphasize the ways in which a machine’s reality departs from our own. People wear clothing for both functional and fashionable reasons. But the forms we use to cover our bodies have changed as technology progressed from handmade to mechanized manufacturing. In this project, machine learning was used to reveal new relationships between items in the Met’s Costume Institute. The intent is to use statistical clustering to increase understanding of how popular forms in clothing have developed over time. Clustering across centuries. Machine learning is used to identify standardized patterns in clothing through history, revealing new insights about manufacturing and mechanization. Courtesy Emily Chu. Networks are ever-present in our lives. Some, in the case of the fiber optic cables running beneath our feet have a corresponding physical reality. But other networks are less visible, such as the connections between people on social networks or the spread of fake news. Martino and his colleagues explore how our experience of these prevalent networks might change if they were made tangible and visible. WonderNet brings common networks to life as interactive 3D sculptures, using physical force to push conflicting nodes apart from each other. One day in London. This visualization, created by senior data visualization engineer Shan He, depicts a day's worth of Uber trips on 4/9/2016 in London. Courtesy Uber Engineering. 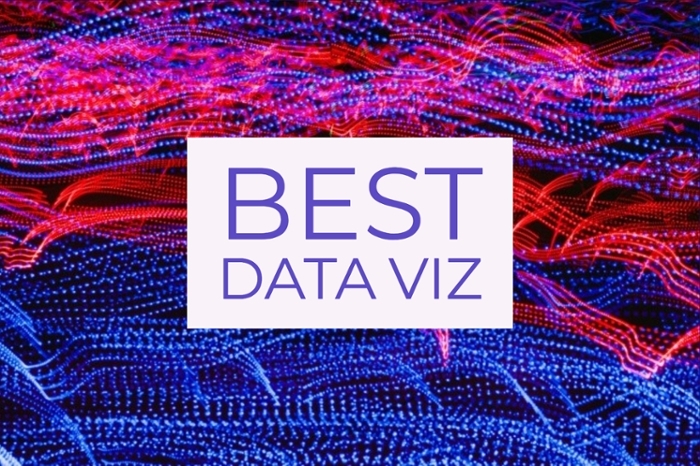 Originally designed for in-house use by Uber, this open-source customizable geospatial toolbox lets anyone be a data viz wizard. The in-browser app “makes beautiful maps in 10 seconds” without coding, says creator Shan He. You can drag and drop datasets, add filters, aggregate, color, and size to create just the right map. People have used it to create maps of California earthquakes, New York City cab rides, San Francisco street trees, commuting patterns in the UK, and more. The long run. Marbles are dropped through medicine cabinets filled with test tubes, syringes, and surgical gloves. The length of time it takes each marble to fall represents healthcare spending for a particular age group. Courtesy The BMJ. Not all visualizations are digital. The British Medical Association (BMA) and the British Medical Journal (BMJ) commissioned artists to visualize UK National Health Service spending for different age groups based on the time it takes for a marble to fall—from 10 seconds for a 20-year-old to 50 seconds for a nonagenarian.